Before this month’s Paris Air Show, Boeing executives showed the complex refashioning of its Everett manufacturing facility for the forthcoming 777X has made rapid progress and offered strong hints that a medium-range 797 plane is waiting in the wings. In a business that plays out over decades, the attention of Boeing’s leadership is unshakably fixed on two key future jet programs that will be critical to this region. In briefings before this month’s Paris Air Show, Boeing executives showed that the complex refashioning of its Everett manufacturing facility for the forthcoming 777X has made rapid progress since December. It all needs to come together perfectly for the large new jet to successfully enter service in 2020. And a top executive offered strong hints that Boeing has made detailed plans for the future launch of an all-new 797 jet — built in a radically different way that will be “transformational” for the company and could have crucial ramifications for Washington state. 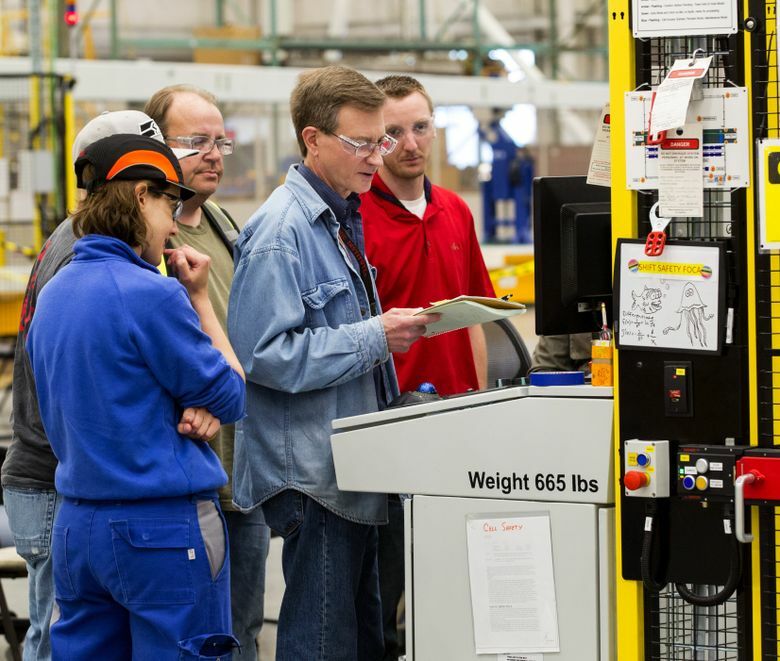 New automated production methods for both jet programs are central to Boeing’s thinking. In his first appearance before journalists, new Commercial Airplanes Chief Executive Kevin McAllister said Boeing will look to technology — both on its airplanes and in its factories — to differentiate itself from European rival Airbus as well as the Canadian, Chinese and Russian contenders that have newly entered the large commercial jet business. A near-term glut of widebody aircraft has depressed orders for the biggest jets and forced Boeing to slash 777 jet production in Everett — and to cut more than 8,400 local jobs in the past year. Yet despite that near-term pain, Boeing remains confident in the long-term trend of air-traffic growth and is prepping now for a brighter future. So it has invested heavily in new, automated 777X manufacturing equipment in Everett. The first preproduction test parts have been produced, the system is being fine-tuned and engineers are gearing up to start building parts for the first airplane, which will be assembled next year and tested to breaking point on the ground. 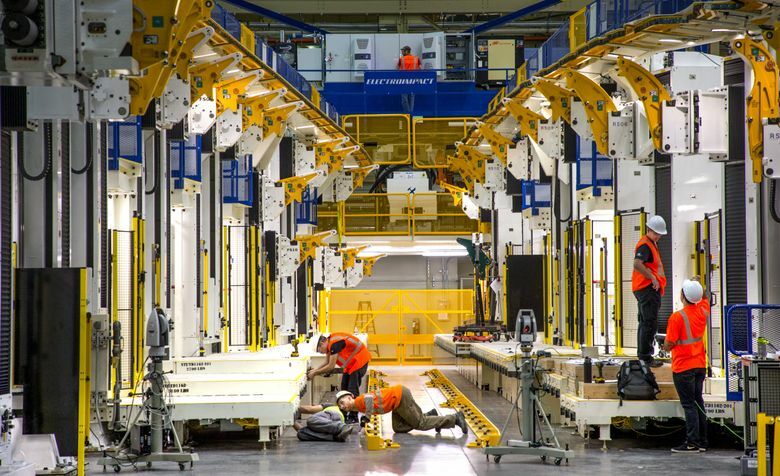 Inside the vast Composite Wing Center, robotic “automated fiber placement” machines — designed and built by Mukilteo-based engineering firm Electroimpact — are days away from laying down the carbon fiber to begin making the long single-piece composite spars for the first airplane. Other carbon-fiber lamination machines build the composite wing skins and the long stiffening rods called stringers. During a tour led by Eric Lindblad, vice president of 777X, the massive high-pressure oven called an autoclave was baking a set of stringers while nearby another automated machine was trimming and drilling a lower wing skin. In an adjacent building, two production lines of equipment are primed and ready in the next few months to take the freshly baked 777X spars and add the major fittings that will support the movable surfaces of the wing as well as the landing gear. Another robot — this one supplied by Spanish engineering firm MTorres — will drill and fasten the rib posts and stiffeners to the spars — each of them 105 feet long, 6 feet wide at the inboard end and a foot wide at the outboard end. In three subsequent stations, mechanics manually add the bigger complex fittings. Inside the main Everett assembly building, Boeing has set up the stations where the wings will be assembled. This equipment is another Electroimpact design, virtually identical to one it built for the Airbus A350 wing-assembly factory in Broughton, Wales — “but the next generation, with more capability,” said Jason Clark, vice president of 777/777X operations. The front and rear spars of each wing are loaded lengthwise into the station along with crisscrossing metal wing ribs made in Frederickson, Pierce County, to form a ladderlike structure. Then a wing skin is placed on top or underneath and robots drill and fasten it all together. Lindblad said Boeing in the coming months will load a practice right-hand wing, one with the full geometric structure but without the internal systems installed, which it will use to make sure all the automated equipment works as it should. 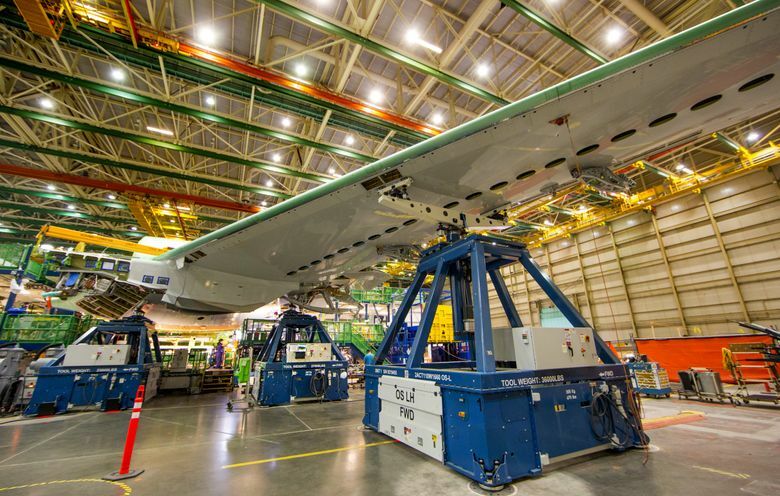 All of this 777X-specific equipment is the relatively straightforward part of the project. Much trickier is that Boeing is simultaneously changing how it makes the current 777, so that the same final assembly equipment will handle either a current 777-300ER with a metal wing or a much bigger 777X with a carbon-fiber wing. It aims to seamlessly switch from one model to the next, with both current and next-generation versions going down the same line during the transition. But that entails completely changing everything. The wing’s electrical, hydraulic and fuel systems are now installed with the wings laid flat on the factory floor, each wing sitting on jacks, instead of the former way of working on it as it hung vertically inside a four-story fixed jig. 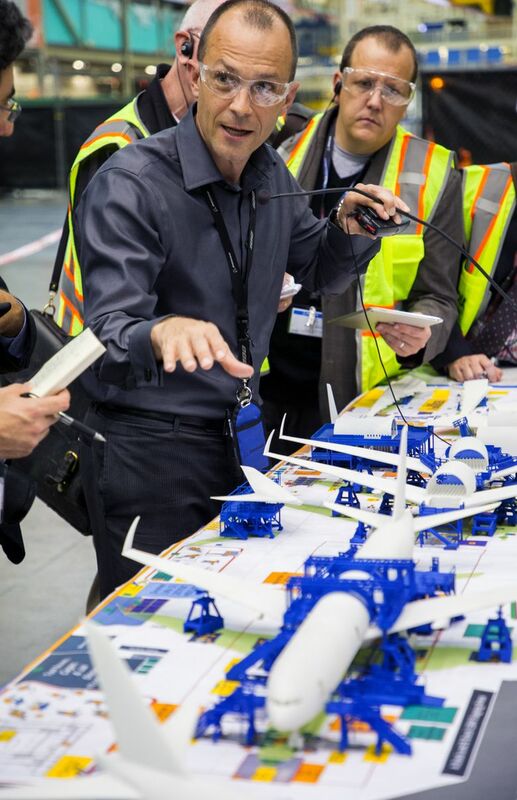 And those computer-controlled jacks move in unison to transport the wings along the floor to the center fuselage, where the wings are joined to the body. Whether it’s a 777 wing or a 777X wing, which has a different sweep and meets the fuselage at a different angle — only the software instructions change. Since December, Boeing has successfully made 10 777s using this body-join system, which it continues to refine. The construction of the barrel-shaped fuselage sections is also completely changed. The large aluminum panels that arrive from Japan are now stitched together by robots instead of being manually fastened by mechanics as the panels are held in fixed jigs. Last year, this new robotic fuselage assembly was causing quality problems, with many fuselage barrels arriving at final assembly full of temporary fasteners or with mis-drilled holes. Now the fuselages built by robots are noticeably free of temporary fasteners. And the scaffolding that still surrounded them in December as mechanics struggled to fix the problems is gone. 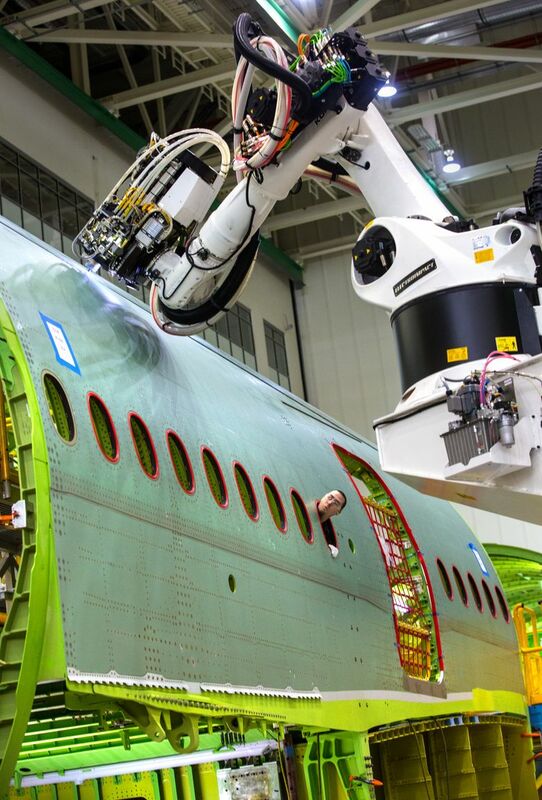 Brad Zaback, 777 deputy vice president and general manager, said fuselage robots are now producing every forward fuselage, every center fuselage and every other aft fuselage for the current 777s being built. He said the aft fuselage work will switch entirely to the robots later this year. Already, he said, the robotic-fuselage facility is producing high quality work, “as good as we’ve ever had” under the former fixed-jig assembly system. One 777 final-assembly mechanic agreed that the general quality of the robotic work had increased immensely since last year. Yet nothing in a factory setting is always perfect. 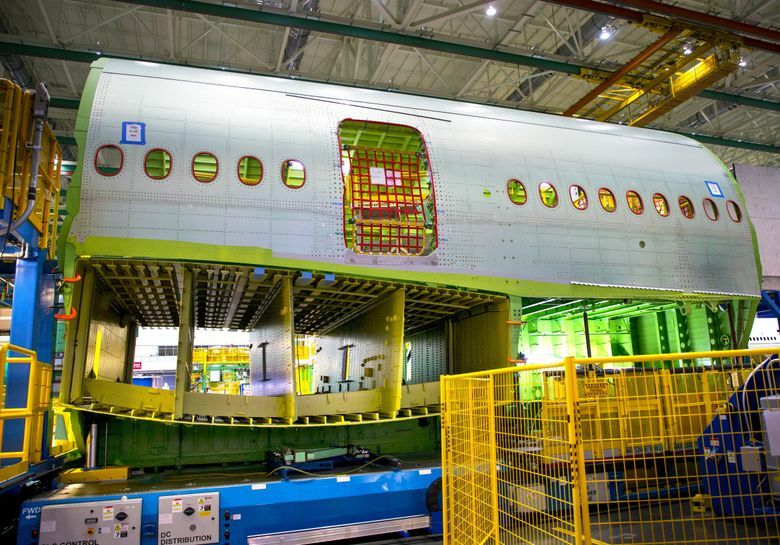 When the aft fuselage barrel destined to be part of a 777 for Saudi Arabian Airlines arrived in the final-assembly bay last weekend, its circumferential joins were studded in temporary fasteners — a sign of significant unfinished work that was the result of a problem in fitting the floor. That was one of the aft sections built the old way in the fixed jigs, not by the robots, said Boeing spokeswoman Karen Crabtree. The 777X transformation requires major construction and remodeling in 5 million square feet of Everett’s factory space, even as production of the current planes continues. Clearly, it takes nerves of steel to undertake such a project. As if that were not difficult enough, Boeing’s backroom engineers are getting ready for a further-out, all-new project. Though prosaically dubbed inside Boeing variously as the Middle of the Market (MOM) or New Mid-market Airplane (NMA), it’s referred to already by outsiders as the 797. Boeing first publicly announced that it was studying this idea at the 2015 Paris Air Show. Two years on, Boeing has talked it over with 57 different airlines and clearly the project is much closer to reality. Mike Delaney, Boeing’s vice president of new-airplane development, described the concept as a twin-aisle airplane seating 220 to 270 passengers with a medium range of 5,500 to 5,700 miles. This is a plane significantly bigger than the single-aisle 737. And though it has much less range than a 787 Dreamliner, it has enough to make it easily a transatlantic airplane. Boeing head of sales Ihssane Mounir said there’s no airplane today fitting this specification, and many airlines are excited at the concept because it would allow them to open up entirely new and unserved routes — just as the 787 did in the ultralong-haul market. He cited Washington, D.C., to Budapest as an example. Such a plane could potentially entice low-cost carriers to open regional international flights such as routes around Southeast Asia or transatlantic. It might also replace many single-aisle jets flying the highly congested routes between China’s three largest cities — Shanghai, Beijing and Guangzhou. “I’m bullish about it,” Mounir said. In his news briefing, new-airplane development chief Delaney made clear that the 797 study is far advanced. Most intriguingly, he said that the composite wing of this aircraft will look much like a smaller version of the tremendously slender and aerodynamically efficient 787 wing — but it will be built in a new way. “It’s a radically different set of parts and assembly sequence and technology that is significantly lower cost,” Delaney said, the result of what Boeing has learned from designing the 787, the first all-composite airplane, and then the composite wing of the 777X. He recalled that Walt Gillette, the lead engineer on the development of the 787, used to say that Boeing’s first carbon-fiber composite airplane would be the most inefficient and heaviest composite jet that the company would ever build. Delaney added that the same learning curve applies to the airplane’s fuselage, which suggests that Boeing may have in mind an all-composite design for the entire airframe. He hinted that he may reveal a few more details in Paris. Speaking about the potential 797, CEO McAllister said that details on who will build the pieces of it, and which sections Boeing will make itself rather than buy from a supplier, remain undecided — and may in the end diverge from what’s been done in the past. “All of us are focused on the production-system transformation, on new engineering tools, new manufacturing tools,” he said. He said Boeing has held detailed discussions on the proposed plane with the three major jet-engine makers but has not yet talked to any of its airframe-supplier partners. Boeing’s future in the Puget Sound region depends on the outcome of that hard look. As reassurance, McAllister cited the company’s huge 777X investment here and the “great capability” in the local workforce. But he was also clear that Boeing must change, and nothing is guaranteed. He’s hung a painting of that steel mill in his Boeing office. “It’s a reminder that we have to reinvent ourselves every day,” McAllister said. Information in this article, originally published early June 8, 2017, was corrected later in the morning. A previous version of this story incorrectly stated that the 777X spar assembly robot was supplied by Electroimpact. This equipment was designed and built by Spanish engineering firm MTorres.